Been having internet issues and that has kept me from blogging regularly, so I'm here to play catch-up with the links from the last couple of days. 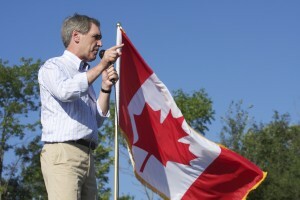 Michael Ignatieff as been playing catch-up all year long and can't figure out why he's not gaining traction. Maybe someone should tell him that his embrace of the middle of the road is uninspiring. The Liberals had changed their stance on more assistance for those on unemployment, the EI bill -- an issue Iggy was ready to go to the polls for just last year. What changed? The unemployment numbers are not much different than last year but now he claims the bill is too expensive. Are the Liberals trying to one up the Conservatives on being fiscally conservative, and do they think that's a path to governing? The fiscally conservative Tories just added $5 billion dollars to the deficit by raising EI premiums -- not as high as originally planned so it's alright -- and hardly a peep. Jack Layton spot on when he points out that successive Liberal and Conservative governments have refused to acknowledge a nearly $60-billion surplus built up in the federal EI account, meaning higher premiums should be unnecessary in the first place. Maybe if it was Michael pointing this out the vote from the left wouldn't be split between four parties. The Liberals did manage to pass a private members bill to reinstate the mandatory long-form census yesterday but sadly it's a largely symbolic move the Conservatives are expected to ignore. A Pyrrhic victory at best and the truth is if he wants to govern he needs something to hang his hat on that's not a bloodless victory. From a progressive's point of view it seems as if the Libs have hired strategists from the Democratic Party. The Tories have backed down on the lump sum payment for injured veterans, agreeing to space it out in monthly payments, but they still have not improved the amount paid out. Canadian veterans receive one fourth of what returning British soldiers receive.